A type of fish that can be found in Grahtwood and Bangkorai. Gargoyles are statues that have been animated by a wizard or a vampire lord, often found guarding dungeons and castles. Some will remain frozen for some time to make their prey think they are still made of stone, before finally bursting out of their stillness and ambushing their victim. Since they're made of stone, they're resistant to damage to some extent. Created by Relmyna Verenim, the Gatekeeper is a giant Flesh Atronach charged with protecting the Gates of Madness in the Shivering Isles. A monstrous beast said to attack adventurers as they rest. Found in the dungeons around the city of Dawnstar. Also spelled Gheateus. A Fey variant considered to be godlike beings. According to legend, Gheateus appears as a man or a group of men who are formed by the earth, and they are said to be surrounded by a host of minor Sylphim. The souls of the dead trapped on Nirn. They exist as spirits only, and can only be damaged by silver or magical weapons. Most kinds of ghosts possess magical abilities. 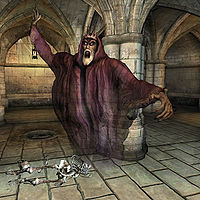 Ghosts can be summoned by wizards. 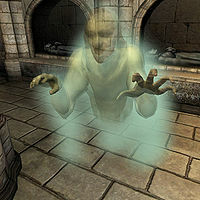 The Dunmer of Morrowind revere the ghosts of their dead ancestors. A type of octopus that can be found in Vvardenfell. These undead are the carrion eaters of dungeons, crypts, and other burial places. They feast on human corpses and other rotting flesh. Although they are not intelligent, they have a natural cunning that aids them in finding food. Because of their vile habits, ghouls have a chance of transmitting a disease to those they bite. Giants are a race of enormous humanoids with colossal strength. 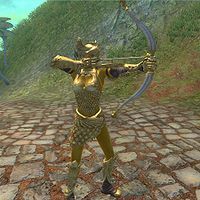 They are found in the wilderness of Skyrim, High Rock, Hammerfell, Cyrodiil and Valenwood. They have thick grey skin, long, powerful limbs, large hands and feet, and thick greyish-brown hair decorated with braids and beads. 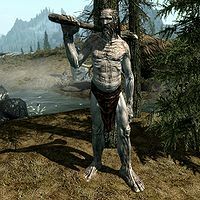 Additionally, most Giants have decorative scars carved into their chests. They clothe themselves in fur pelts adorned with the bones of animals and people, although many prefer a simple loincloth. Although they tower above most races, their height can vary. Some stand between 11 and 12 feet tall, whereas others can be several times the height of the average person. Female giants are much less common than males, and the only known sightings have been in the Wrothgar region during the Second Era. Larger than normal bats. 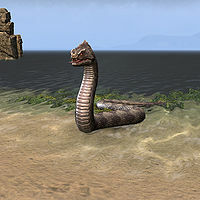 These creatures can be found across Tamriel. 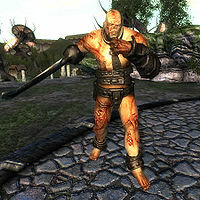 The common scorpion and the more deadly Giant Scorpion can be found in most arid regions of Tamriel. The sting of the scorpion can paralyze the unsuspecting adventurer so extreme caution is advised. An extremely powerful wraith which can wield swords and project curses that damage Strength and Endurance. 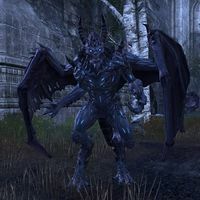 Can be harmed only by silver, Daedric and enchanted weapons. Can also be harmed by non-frost based spells and some conjurations. 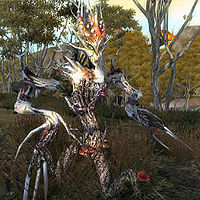 The Gnarl, or "Walking Tree" as it's sometimes called, is one of the strangest creatures of the Shivering Isles. Like the Elytra, this animated plant can be found roaming almost anywhere on the Isles. 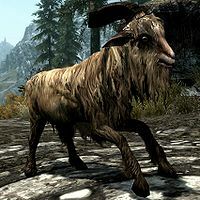 One of Sheogorath's truly unique creations, the Gnarl has the most unusual trait of being able to use magic cast upon it, and harness that power to bolster its own defense, becoming resistant to just that element for a short time. Goats are passive creatures generally found on mountain slopes. They are hunted for their hide, meat, and horns, and can also be domesticated. 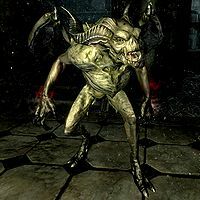 Goblins are humanoids found throughout Tamriel. They range in height from three feet to over eight feet. Their eyes are yellow and resemble a cat's. 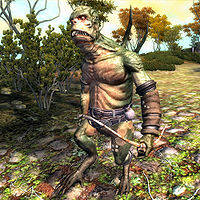 The goblin, much like the orc, is found in various types all across Tamriel. 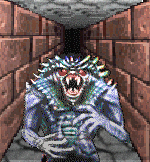 Although not terribly skilled in combat, and rarely in magic, goblins can become dangerous in the large numbers in which they are usually found. 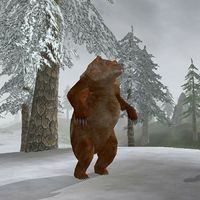 They are sometimes organized in clans, and some even use domesticated animals, such as the Durzog of Morrowind. See also: Riekling. They are a matriarchal society, tending to look down upon all males. Even male Golden Saints consider themselves and other males to be lesser. A type of shark that can be found in Eastmarch. 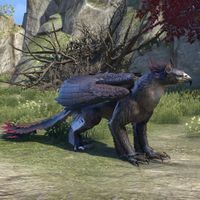 The now-extinct gooblet was a flightless bird that lived along the Hammerfell coast prior to 1E 808. By the mid-Second Era, rare taxidermied birds still existed and gooblet feathers were sometimes worn by priests of Onsi, or used to make toys. 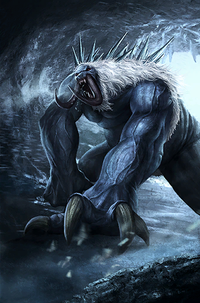 Sometimes called "ice trolls", these powerful creatures have in common with their mainland namesake regeneration and vulnerability to fire. They are often found in the ice caves of Solstheim. 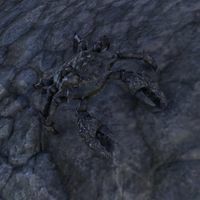 A type of terrestrial crab found in Upper Craglorn. Cyrus, transformed into a gremlin. Note the red vest. A small, harmless creature related to goblins, whom they can often be found living alongside. Sometimes known as an Orc-rat. They are used as slaves by the Altmer. A number of gremlins and other goblin-ken lived in the city of Orsinium. 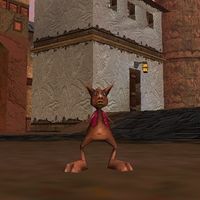 Cyrus the Redguard was once transformed into a gremlin by Archmage Jaganvir of Stros M'Kai. 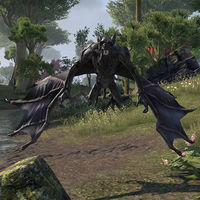 Grievous Twilights are winged Daedra who often serve Molag Bal and Nocturnal. They are corrupted forms of Azura's Winged Twilight. A powerful animal that can attack not only with its powerful jaws, but with both front paws. 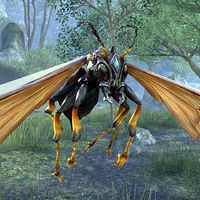 Found throughout the wooded and snowy areas of Tamriel. See also: Brown Bear. 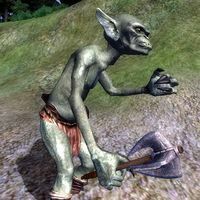 The Grummites are frog-like, tool-making creatures of the Shivering Isles with a primitive culture, very much similar to the goblins of Tamriel. They can often be found protecting the egg sacs that house their young, even though the book From Frog to Man states that they tend to ignore their eggs once laid. Gryphons (sometimes spelled griffin) are large flying creatures described as a mix of lions and eagles. They can be found on Summerset Isle. Their feathers possess alchemical properties. Taverns are often named after the creatures. Hippogriffs are similar animals. 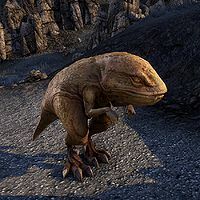 Guar are the primary domesticated herd animal of Morrowind, and are not usually aggressive. Dunmer sometimes use them as pack animals. This page was last modified on 5 March 2019, at 10:15.